On Thursday, February 8, 2018, a house fire broke out at approximately 5:30 PM at 10835 Bellagio Road. It did not take long for the roof to collapse prompting defensive measures by the LAFD, who then deployed 107 firefighters to to the scene. 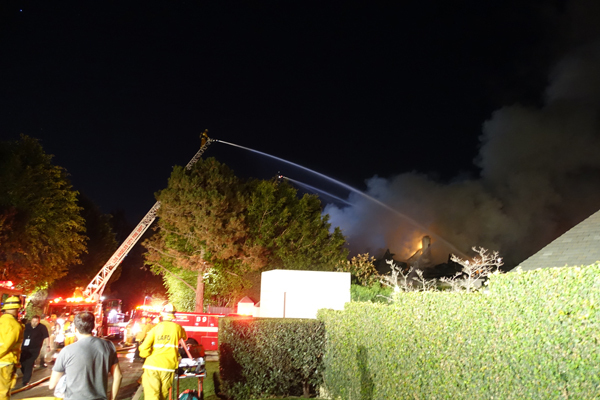 There were four ladder trucks deployed with three engaged to battle the nearly three hour blaze. Two firefighters were injured; one suffered burns to his face and hands, the other suffered burns to his ears. Both were hospitalized and reportedly in fair condition. The Bel-Air Association expresses their gratitude and appreciation to the Los Angeles Fire Department and their skilled and brave firefighters; and extends its sympathy to the family at this tragic time and glad that they are safe and unhurt. "NotifyLA (http://emergency.lacity.org/notifyla) is the City of Los Angeles’ official mass notification system used during times of emergencies and disasters. 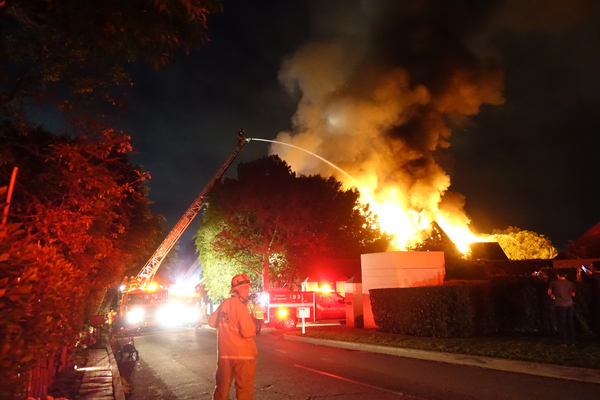 The Bellagio structure fire in Bel Air was a single incident (unlike the Skirball Fire) and would not necessarily trigger a mass notification from the City Emergency Management Department." The Bel-Air Association encourages all residents to sign up for the emergency alerts. If anyone has trouble signing up for the alerts, please contact the Bel-Air Association office (310) 474-3527, for assistance. Link to sign-up for NotifyLA here. For notification of LAFD incidents in your area, sign up for alerts at http://www.lafd.org/alerts or you can download the Pulsepoint App - http://www.pulsepoint.org/download/ and select the LAFD Bureau you wish to follow. Our Bel-Air area is divided between Valley and West Bureau so you should follow both. Under settings you can select to be notified of Vegetation Fires, Structure Fires or Major Traffic incidents. Link to sign-up for LAFD Alerts here. Link to sign-up for Pulsepoint App here.